Whitey's Lindy Hoppers - The Greatest! It is almost 70 years since Herbert "Whitey" White started a professional performing group of Savoy Ballroom swing dancers in 1935. Yet the film clips of Whitey's Lindy Hoppers continue to delight and astonish audiences and inspire new generations of swing dancers. Whitey's group was formed from the creme de la creme of the Savoy; they were the top dancers in the top ballroom of the Swing Era. With Whitey's entrepreneurial skills, these Harlem youngsters were catapulted into world recognition thru both live performance and film. Their swing dance innovations had permanent impact on the social dance styles of the United States, Europe, Australia, and even Latin America and parts of Africa. Whitey's Lindy Hoppers was the brainchild of Herbert "Whitey" White. An African-American man known as "Whitey" because of the streak of white in his hair, he was a former boxer who became a bouncer at the Savoy Ballroom. At one time, more than 70 swing dancers were employed by Whitey. He had a good eye for talent and, like a good coach, he knew how to nurture it. He gave many future entertainers their start in show business. By late 1936, Whitey's dancers had officially made the big time. His top dancers worked a 6-month gig at the the famous Cotton Club under the name "Whitey's Hopping Maniacs" Meantime, Whitey pulled together a second group of top dancers to perform for the first time under the name "Whitey's Lindy Hoppers" in their first major Hollywood film, the Marx Brother's zany A Day at the Races. In the early 1930's, as word got around about the sensational swing dancing at the Savoy Ballroom, requests came from downtown socialites and rich folk who wanted to have Lindy Hoppers perform at their lavish parties. Whitey, who got to know the young dancers well, was able to hand pick exciting dancers who were also socially adept and reliable. They were invariably delighted to make a few dollars doing what they loved (Aren't we all?). A father figure to many of these dancers, Whitey would send them downtown to those fancy digs with the admonition, "Remember, ain't nobody better than you." This advice must have come in handy in 1937, when a group of Whitey's Lindy Hoppers stood on line to shake hands with the Queen of England! This self-respect and pride permeated the Savoy Ballroom, one of the few places on earth where Blacks and whites could meet on the dance floor as equals. "Remember, ain't nobody better than you." In time, the sensational dancing of Whitey's hand-picked dancers came to the attention of the media. When they entered the Harvest Moon Ball competition in 1935, ballroom afficianados had their heads turned by the fast, fluid new dance to swing music which incorporated African influences and jazz rhythms into the standard European social dance framework. Clips of Whitey's Lindy Hoppers are included in a number of compilations and documentaries; like the the full-length films cited above, these are available for purchase online at SavoyStyle Swing Dance Shop vintage video secton. In this rare photograph, Whitey can be seen with the white tie and the white streak in his hair. 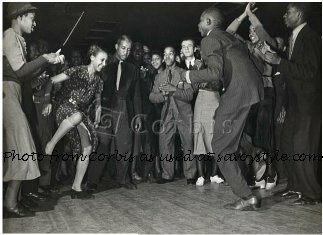 He is teaching Ann Johnson (Frankie Manning's partner in Hellzapoppin') a step which she does with Long Legged George Grenidge. Observing, to the right, is Al Minns. the Cotton Club group named Manning's Lindy Hoppers. Dancer Louise" Pal" Andrews served as Whitey's "Gal Friday". While in Hollywood working on the Lindy Hop sequence in the Judy Garland film "Everybody Sing", Whitey got in a dispute with the producer. It seemed that the producer gave young Judy Garland breaks from the set, but would not give the young Lindy Hoppers any breaks. Concerned about protecting his dancers from both exhaustion and second class treatment, Whitey tore up the contract. The sequence was removed from the film. Between gigs these dancers always came home to the Savoy Ballroom. Their growing performance skills must have brought a lot of excitement to the Cat's Corner jams, where top dancers could shine in a circle of spectators. And the general standard of dancing at the Savoy must have been kept quite high with these talented dancers out there on the dance floor and competing in the Saturday night contests. 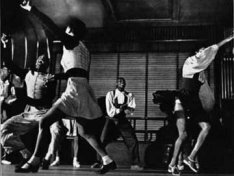 No matter how far their professional careers went, Whitey's dancers were always, first and foremost, social dancers and true jazz dance improvisors, even after they had a number of choreographed routines under their belts. In this they paralleled the musicians of the great Big Bands, who could perform tight arrangements and still blow completely original jazz improvisations night after night. The interaction between the improvisations of the great dancers and the great musicians made for fireworks! The dancers transposed the rhythms and riffs into movement and the musicians, watching, responded to what they saw with a frenzy of jazz innovation. The musicians' idea of relaxation after working hard at a Savoy Ballroom gig was to stop by Minton's, an after hours club in Harlem. There they would meet up with whichever other musicians were in town --Benny Goodman's band, Duke Ellington's, Harry James and so on-- and they'd jam till breakfast time. Clearly, like the dancers in Whitey's Lindy Hoppers, they loved what they were doing. That joy was an essential ingredient of the greatness of the Swing Era.